We had a few bonus visits recently with Greg's daughters. We just don't get to visit enough, so even a few hours together count. So do shopping at Kendra Scott, and eating at Brasserie 19 and El Real. First up was Capri, who was on short break from UNT in Denton. We did brunch at Brasserie 19, which has one of the best menus in Houston, and Executive Chef Amanda McGraw is tops. Amanda also happens to be an authority on cheese, which in my book earns many extra points. Plied with plenty of food and an accompanying drink, we made easy targets in Rice Village where we did a bit of shopping, with Greg's credit card having an out-of-wallet experience at the new Kendra Scott location for a Christmas gift for Capri, and a couple of gifts for me. This visit was cool because there's something different about Capri. She's more grown-up, enthusiastic, earnest, goal-driven. What happened to the all-night, all-out gamer? Well, for one, she has a boyfriend. And he's a musician, not a gamer. 'Nuff said. Next up, Tahni. Tahni's burgeoning photography business has her zig-zagging the country and the globe and every now and then, she lands in Texas. We had an awesome day with her, including Daddy-Daughter time in the morning (late lunch at Harry's), and time for me in the afternoon. Happily, it was Neighborhood Monday at El Real Tex-Mex, located dangerously close to our home and featuring downright perilous specials. Visits with Tahni are always fun because she always has great stories, and we always share something artsy. Oh, and I get to live vicariously a little because she's going to the annual tree-lighting tonight at Rockefeller Center. Lucky! Food tends to play a leading role in our visits. But how can it not? Houstonians love their restaurants, after all. According to a new study, Harris County hotels and restaurants had a total economic impact of $13.2 billion in 2011. That includes $7.9 billion in sales and $5.3 billion in indirect and induced economic activity. Really? That's serious cash. Capri and Tahni, it was great to see y'all. Can't wait for the next visit! Thanksgiving is upon us. That's partly why today's post is about homelessness. Wait! This isn't depressing - it's HOPEFUL. Often I say how lucky we are to have so much at our fingertips in Houston. But not everyone living in the city feels so fortunate. I'm referring to our thousands of homeless people who aren't thinking about art galleries, theater, festivals and fundraisers. They're thinking about whether they can feed their kids tonight. About whether the lights and heat will go out - again. About whether 'he' will come home and beat them once more. About saying no for real to the drugs and finally getting clean. Thanksgiving is a time for reflection. It's a time when we profess and confess our blessings and hopes for now and tomorrow. Many people open their hearts as the holiday season pushes full speed ahead, and they often spend time volunteering in shelters and soup kitchens serving the homeless. For me, contemplating homelessness doesn't happen once a year. It happens every week. I volunteer in the kitchen at the Star of Hope shelter for women and families, preparing and serving food to women and their children. The kids are heart-breakingly cute, and only know a transient life, while the women range from determinedly transitional in their outlook to desperate yet hopeful. This week at the shelter, the amazing kitchen staff was in high gear with Thanksgiving preparations. I was fortunate enough to help prep the meal for an anticipated 400 guests. They'll have wonderful turkey, from-scratch gravy, stuffing, mashed potatoes, candied yams, plenty of other veggies, pumpkin pie and lots more. I found it impressive that they were even roasting pumpkins to make the pie filling (I can confirm it was delicious). There's something very satisfying about dozens of pumpkin pies being staged for baking. In a shelter, the staff gets creative with menus and I have to say, working here for most of the year I've seen some pretty crazy food ideas which somehow always seem to work. A place like Star of Hope keeps you humble and prevents you from feeling sorry for yourself for too long. After all, I have so much to be thankful for, despite an odd and challenging year. And, this Thanksgiving I'm very content with just making a side salad since I've already helped with a 400-person dinner! P.S. looking for volunteer opportunities in your city? Try VolunteerMatch. Recently, I had an opportunity to visit my folks in upstate New York. Whenever I go back to visit the ol' hometown, I get sort of nostalgic. This visit was no exception. The nostalgia for me isn't so much about trying to climb back to the past, but instead about taking a fresh perspective on the places I mostly took for granted growing up. It's nice to have roots that remain firmly planted in the town where I grew up. The Utica area was once a boom-town after WWII, but now does not really have much of an economic base. While I don't think I'd really want to live and work there now, what matters most is that I get to visit with, and cook for, Mom and Dad. The Saranac Brewery (above) was founded as the West End Brewing Company in 1888. I was a tour guide here for two summers. It's kind of fun when you can speak intelligently about brewing beer when attending a fraternity mixer in college! The old Bank of Utica, known as 'the bank with the gold dome.' I love the overly fancy architecture and, if you ignore its surroundings, you'd swear for a minute that you were in London. I had my first banking account here, saving coins in those cardboard pig-shaped folders to deposit when they were full. The Stanley Theater, built in 1928. 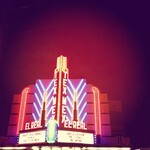 I've been here many times for concerts, plays and ballets. One of my favorite memories is our family trip to see Bill Cosby perform, and watching my mother laughing so hard that she cried through most of the show. The Raymond Simon Convergence Media Center at Utica College. Not everyone gets to have a center named after their Dad! We were lucky to grow up as faculty brats, and Professor Simon has made such a mark on the communications field. And, the broadcast studio in the center is named after my Mom. How cool is that? The New Hartford house where my sister and I were raised. Back then, everyone's doors were unlocked, kids played freely in backyards, front yards and the streets, and the parents sounded bells and buzzers and horns to call the kids in for dinner. We often enjoy dramatic sunsets in upstate New York. Part of it is the atmosphere, and part of it is a lower level of pollution than other places. To me, this is a magic show that never gets old. And in my mind, when I'm back in upstate New York, nor do I. We're lucky to have so much at our fingertips in Houston. When it comes to shopping, we're truly spoiled for choice. The selection and uniqueness offered by our thousands of locally-owned boutiques is both exciting and overwhelming. 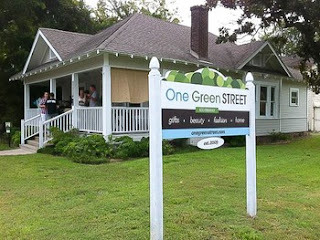 An awesome shop called One Green Street relocated to the Heights, reclaiming a period bungalow and filling it with all the accouterments of an organic lifestyle. You have jewelry, clothing, beauty, healthy home options and more. 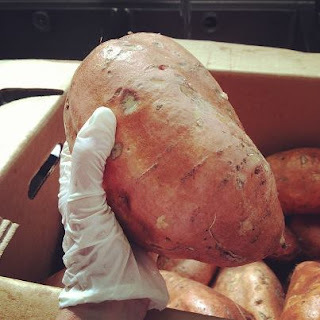 It's fun to browse, and even better when you discover how the items are carefully selected for health and sustainability, many of which come with cause-based associations. Look closely, and you'll see a repurposing of random and otherwise utilitarian items which ultimately elevates things like the common 1930s vintage icebox hinge. Love it. And the localist in me loves it even more. Supporting Houston's boutiques helps return money to our local economy. And a place like One Green Street helps return kindness to our environment while offering a healthier way to live.